Don't be fooled by the delicate-looking nature of this ring, as it commands all kinds of attention on its own for its refined beauty and polish. This Sterling Silver 2mm Flat Band is an elegant choice for a ring, and has a beautiful way of sitting on the finger that makes you appreciate, once again, the finer and simpler things in life. This expertly crafted ring is cast in sterling silver (.925) with a slender design that brings out both the feminine look and feel of the ring. It features a flat surface matched with carefully carved sides that together make for a soft, rounded edge. The ring fits easily on the finger and magnificently reflects the light from its high polished surface. 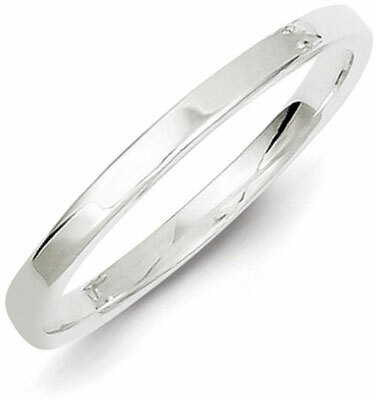 At 2mm wide, the band is one of the most finely crafted, sterling silver rings available.